Gunfire struck five people, killing one person, at ZombiCon in Fort Myers, Fla., sending hundreds of people running for their lives. The suspect fled as panicked ghoulish attendees heard about six to seven shots in what police described as a “shoulder to shoulder” crowd just before midnight, witnesses said. One such witness saw first responders leaning over at least one person on the ground – and another covered by a white sheet along the 2200 block of First Street. “I just saw somebody on the floor. They were all dead and the cops were saying, ‘get back, get back,’ and everybody was all rioting and crap,” another witness told WFTX-TV. One of the shooting victims died at the scene, cops said. About 20,000 people were expected to attend the zombie-themed street festival, authorities believe, some of whom were seen in video footage sprinting for safety down a downtown Fort Myers street. “You can imagine with that many people, there was people taking cover, officers were running toward the shots and that’s when we located victims,” Fort Myers police spokesman Lt. Victor Medico told reporters near the site of Saturday’s attack. The shooting wounded four victims, all of whom have been hospitalized with non-life threatening injuries, authorities added. The violence “deeply saddened” the event’s organizers, Pushing DaiZies, they wrote on Facebook. The shooting broke out just before the festival was scheduled to end at midnight. It’s not often you hear of fears of a zombie invasion – and if you do, it’s almost certainly on television. The country’s contingency plans for a zombie onslaught emerged in from an unclassified document, obtained by Foreign Policy magazine, called ‘CONOP 8888’ – otherwise known as ‘Counter-Zombie Dominance’. The document is dated April 30, 2011 and is a detailed synopsis for battling many kinds of zombies. According to the plan the ‘worst case threat scenario,’ is a zombie attack in which zombies eating lots of humans therefore infecting them quickly, leaving little time for a response. The document also addresses ‘CZs’ otherwise known as chicken zombies. ‘Although it sounds ridiculous, this is actually the only proven class of zombie that actually exists,’ the plan states. ‘So-called ‘CZs’ occur when old hens that can no longer lay eggs are euthanized by farmers with carbon monoxide, buried, and then claw their way back to the surface,’ CONOP 8888 notes. Other possible attacks include evil magic zombies created through occult experimentation and vegetarian zombies which survive on plants so pose no threat to human life and zombies from space. 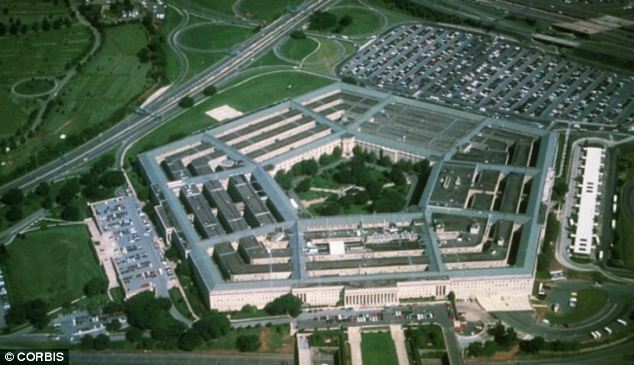 The report contains a disclaimer that ‘this plan was not actually designed as a joke’, but it originated after military planners in Omaha, Nebraska, wanted a scenario for dealing with a widespread national emergency. They created a zombie attack plan that covered training civilians how to survive in a post-apocalyptic world – deployment of military was also a large factor in the plans. ‘The document is identified as a training tool used in an in-house training exercise where students learn about the basic concepts of military plans and order development through a fictional training scenario,’ Navy Capt. Pamela Kunze wrote to the magazine in an email. It is not unusual for the Army to be called upon to save the day in zombie films. In 2004 comedy Shaun of the Dead, soldiers arrive just in time to save the film’s hero. 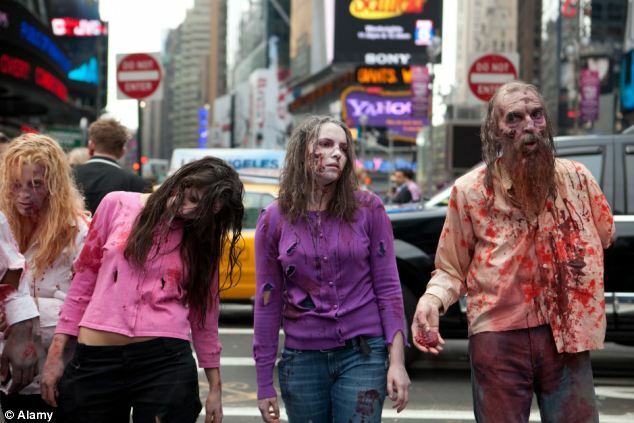 In 2012, troops in the US were trained using a mock zombie invasion. Hundreds of military, law enforcement and medical personnel observed the Hollywood-style production of a zombie attack as part of their emergency response training. In the scenario, dubbed ‘Zombie Apocalypse’, a VIP was trapped in a village, surrounded by zombies when a bomb exploded. The VIP was wounded and his team had to move through the town while dodging bullets and shooting at the invading zombies. At one point, some of the team are hit by zombies and have to be taken to a field medical facility for decontamination and treatment. 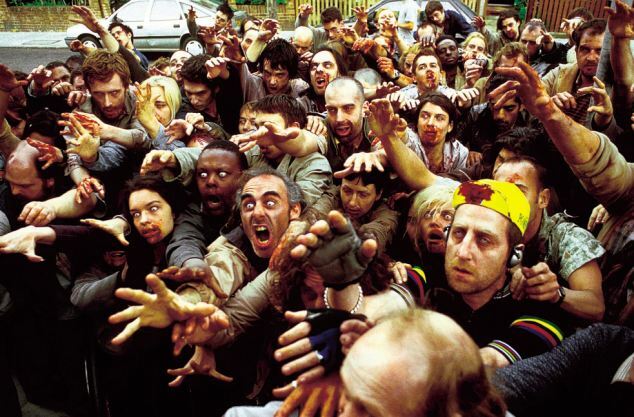 In 2012 Britain’s contingency plans for a zombie onslaught emerged in a response to an enquiry from a member of the public. A Freedom of Information request has shown the surprising level of readiness for the eventuality. The Ministry of Defence would not lead efforts to plan for such a horror attack or deal with the aftermath, reported by the Daily Telegraph, because that role would rest with the Cabinet Office, which co-ordinates emergency planning for the Government. The MoD replied to the FoI request: ‘In the event of an apocalyptic incident (e.g. zombies), any plans to rebuild and return England to its pre-attack glory would be led by the Cabinet Office, and thus any pre-planning activity would also take place there. ‘The Ministry of Defence’s role in any such event would be to provide military support to the civil authorities, not take the lead. Would you like some brains in your beer? The American Pale Stout, which has been dubbed Dock Street Walker, is made with malted wheat, oats, flaked barley, cranberry and an extra-special ingredient – smoked goat brains. “The pre-sparge-brain-addition provides this beer with intriguing, subtle smoke notes,” the brewery says in a press release. “In true walker fashion, don’t be surprised if its head doesn’t hang around forever. The beverage, which Dock Street Brewing Company is calling “quite possibly the smartest beer you’ll ever drink,” will be released on Sunday before “The Walking Dead” season finale. This isn’t the first time a brewery has crafted a beer in honor of an AMC drama. Marble Brewery in Albuquerque, N.M., made two “Breaking Bad” brews in honor of the series’ finale in August. However, those didn’t contain any unusual show-related ingredients. Kyle Bishop figured it was risky when he applied to a University of Arizona Ph.D. program in English eight years ago by proposing a dissertation on zombie movies. The program approved Mr. Bishop’s proposal, and he is now chairman of Southern Utah University’s English department. The 40-year-old has been invited to give zombie lectures in Hawaii, Canada and Spain. “It’s clearly now acceptable to study zombies seriously,” he says. Just as zombies – those mythical revived corpses hungry for living human flesh and gray matter – have infiltrated pop culture, they have also gotten their hands on our brainiest reserves: the academy. Mr. Bishop is among an advancing horde of scholars who, compelled by the cultural history and metaphor of the undead, are teaching and conducting research in disciplines from economics to religion to medicine. The last five years have seen 20 new scholarly books with “zombie” in the title or topic category, according to Baker & Taylor, a distributor of academic and other books; in the 10 prior years, there were 10. JSTOR, an online archive of about 2,000 academic journals, says the journals have run 39 articles invoking the undead since 2005, versus seven in the preceding 10 years. Mr. Bishop’s timing was impeccable. His dissertation coincided with a zombie onslaught that infected television, literature and other media. AMC’s TV series “The Walking Dead” is a top-rated cable show, and the 2013 zombie movie “World War Z” grossed $540 million globally. Now, zombies thrive on campuses like California State University, East Bay, in Hayward. Christopher Moreman, a philosophy professor there, co-edited a two-volume collection of essays on “the Humanity of the Walking Dead” and “Cross-Cultural Appropriations” of the monsters. The initial plan was for one volume, he says, but over 100 proposals arrived. When Mr. Moreman worked the theme into a course – “Philosophy 3432: Religion, Monsters and Horror” – he says he drew 55 students vying for 35 spots. Michael Poliakoff, who directs policy for the American Council of Trustees and Alumni, says the proliferation of undergraduate courses in topics like zombies and vampires is helping ruin American students’ brains. Citing various studies, Mr. Poliakoff says many U.S. college graduates still lack proficiency in basic verbal literacy. Zombie scholars say their subject is worthy of study because the living deads’ history and ubiquity in modern literature and culture present metaphors ripe for analysis. Self-described “zombie scholar” Sarah Juliet Lauro, a Clemson University assistant English professor, acknowledges that some think it is silly or inappropriate to study the ghouls. She counters that “it’s a deeply important mythology that is specifically about slavery.” She is finishing a book tracing zombie folklore to its 18th-century roots in the Haitian Revolution. Zombis were field laborers raised from the dead who led a slave rebellion. Her book, “The Transatlantic Zombie: Slavery, Rebellion and Living Death,” examines how zombies came to represent the struggles of slavery and colonialism. Max Brooks, author of hit pop-culture books like “The Zombie Survival Guide” and “World War Z” – often cited in academic works – is skeptical about exploring the undead theoretically. “It just becomes academics writing papers for other academics,” he says.